Start Webometric Analyst and click the Books tab to get the Google Books option. Google book search can be queried with the API either with a single query (Run Query and Save Results button) or a list of queries, one per line, in a plain text file (2. Search Google Books with all Queries in File button). A significant limitation of the API is that it reports approximate matches for a query if there are no exact matches. It is impossible to tell whether the matches are exact or approximate. This makes the results little use for altmetric purposes without manual filtering to check. a list of authors in exactly this form, if possible: Li X., Thelwall M., Musgrove P., Wilkinson D.
If the data is in Excel then each of 1-4 should be in a separate column with one row for each book (small example saved from Scopus). If the data is in tab-separated plain text file, then each of 1-4 should be separated by a tab, with one line of the file per book. If using Excel, you must first save the worksheet with the data using Save As and then selecting the file type: Text (tab delimited) ( *.txt). Once you have the data, four steps are needed to process it. Create the queries to be submitted to Google Book Search. Webometric Analyst will create these queries from your data file. Click button 1 below and follow the instructions. Filter out the bad Google Book Search matches. Many of the matches returned by Google Book Search may be approximate and these incorrect citations can be filtered out using button 3 below. Add the filtered matches to the original (i.e., unfiltered) results file. This adds up all the Google Books citations for each book and adds the sum to the original unfiltered (i.e., including the bad matches) results file. Button 4. [optional] Add citation data from another source to the Google Books Search results. This is only for if you have a separate source of citation data and you want to add it. Button 5. 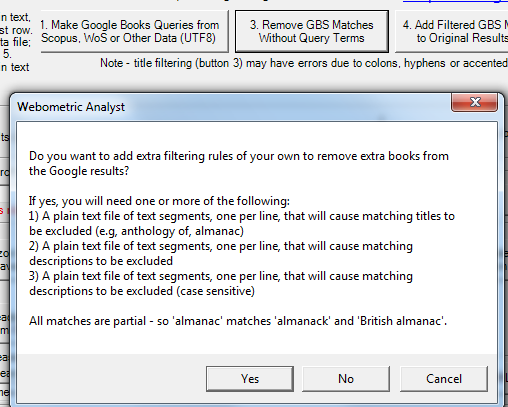 Tip: if you want to add your own additional filtering rules in Step 3, you can add text that will filter out matching titles or descriptions - answer Yes to the question below.